When it comes to kitchen design, most homeowners opt for neutral colors, such as white, which has been a very popular color choice for the kitchen lately. It sits well with modern counters and cabinets design, it’s easy to incorporate with the rest of the house, it opens up space, brightens it up, and it gives your kitchen a touch of elegance and the sense of cleanliness. On the other side, if everything in your kitchen is in one color, from floors to tiles, your beloved kitchen can easily go from neat to sterile and bland. You’ll see how introducing a slight contrast to your kitchen can enhance your kitchen space, without it taking over the spotlight. If you have open shelves in your kitchen, just that can be the place where you can experiment the most to see how different colors go with your kitchen and with your personality. Place a few colored plates on your shelves, along with bowls and glasses and some other kitchen necessities. Spices stored in little glass containers are a color scheme for themselves. You can keep all kinds of things on their kitchen shelves like cooking magazines or ornamental pots. Now that you established what color you like the most, try to take it further by placing different items in the same or another complementary color around your kitchen, say kitchen towels, or chair pads. Black is the best color if you think something is perhaps “too white”. It gives that perfect balance and contrast to white space, making your eyes rest a little. The smallest details in places you maybe didn’t consider, like black window trims, cabinet knobs, or a black pattern for the kitchen tiles and floors. It’s the utmost elegant combination and without it, every bright color would be a little lost. If black is too dark for you, different shades of grey are also very complementary for white. Maybe you didn’t even consider turning your appliances into a fun and colorful addition to your kitchen. Most people will choose a colored appliance if they have the option. They make a unique cachet for any kitchen. Starting with your fridge design, you can have all of your appliances custom made in matching color, or you can buy a set of all appliances you need, in the same design. Those will not only be your very own, different from store-bought items, but that way you don’t have to disrupt your kitchen design too much with mismatched appliances that you keep away from the display. Nothing will bring warmth and coziness to your home like a touch of wood. Same goes for the kitchen. 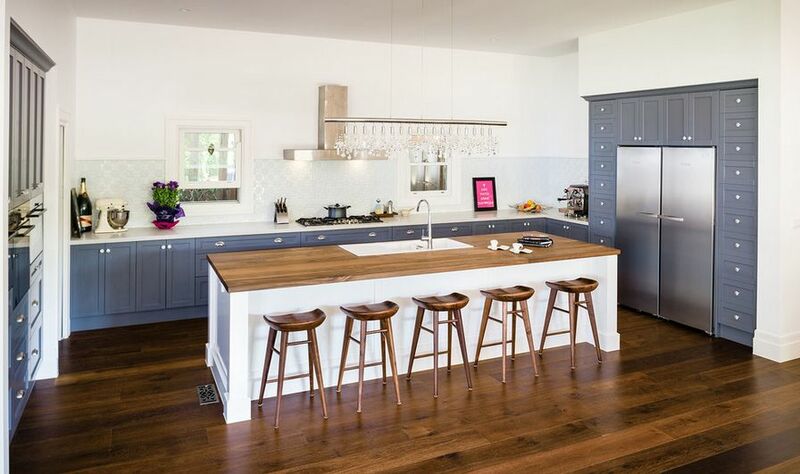 Wood can go a long way, from modern style bar stools to refined cutting boards polished to perfection for a sophisticated look, to rustic storage boxes or kitchen doors for a farmhouse inspired kitchen decor. Of course, you can decide how far you want to go and what color would suit you. Again, dark mahogany floors will provide a contrast which is a significant enhancement, but for a more subtle touch, and if you wish to include more wood items into your kitchen, like dining tables and chairs, opt for a softer color of wood, like different shades of beech, or walnut. If you’re not afraid to try something bold for your kitchen, you can go with some vibrant turquoise colored chairs for your kitchen island. Upholstered kitchen chairs with a pattern or maybe embroidered details on them, undoubtedly are a bold yet refined part of kitchen decor. You can experiment with other furniture-style details in the kitchen to make it stand out and to make it more welcoming. Light can bring a warm atmosphere into any space, but the medium you choose for that purpose can also make an impact on your house decor. Large pendants over your kitchen isle will complete the whole kitchen look and shine the light on all lovely meals you’ll be having. Again, there are many styles you can choose from whether you prefer more rustic looking ambiance or you prefer modern and forward fixtures. A grand brass chandelier will make a focal point of the space, but a chandelier of numerous glass globes put together like a bouquet and placed over the isle will also bring a delicate but modern touch to your kitchen space. Flowers and foliage are an irreplaceable addition to any home. No room would be complete without a touch of something green to feel a little closer to nature and to care for it. You can bring decorative flowers to your kitchen, or keep a beautiful bouquet of fresh flowers in a vase, but a few planted herbs on your windowsill or countertops simply belong in the kitchen. Plus, you’ll have your fresh herbs, like basil, cilantro or oregano for the cooking, and your kitchen will smell amazing.